A cushion-shaped sapphire weighing 478.68 carats held by diamond floral motifs at three points, diamond frame to the reverse and suspension hoop, with French assay mark for platinum. With maker's mark HP flanking an ace of spades for the French workshop of Henri Picq, no. 5026 to the suspension hoop. With report #41140 dated May 15th, 2003 from the SSEF Swiss Gemological Institute stating that the sapphire is of Sri Lankan origin and has no indications of thermal enhancement. "The first reference made by Cartier to this 478 carat sapphire with a royal history was in 1913 when the gemstone was added to a collection of seven other sapphires to form a magnificent sautoir. 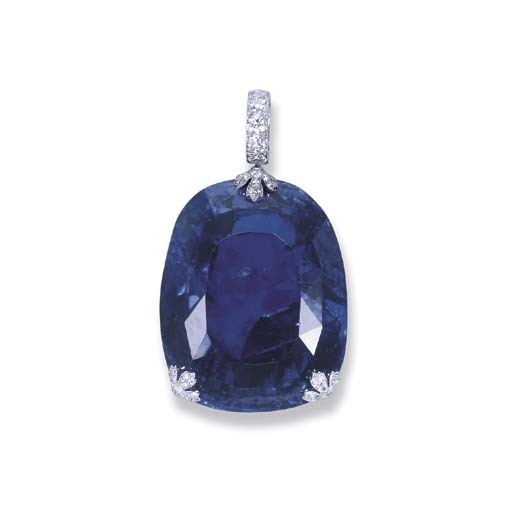 Later that year, the diamond necklace was altered to exclude the smaller sapphires in order to focus on the large sapphire drop attached to a pendant ring of calibré-cut sapphires. "The design for the sumptuous jewel changed again in 1919 and became Cartier's most valuable item exhibited in the Hotel Maria Cristina at their Autumn Show in San Sebastian. Being the talk of the town, the Queen of Spain, Victoria Eugenia, Queen Mother Maria Cristina and the Princess of Bourbon arrived to admire the display in all its splendour. "Two years after the Spanish exhibition, the sapphire drop suspended on the diamond necklace, was purchased by King Ferdinand of Romania. His beautiful consort Queen Marie (1875-1938), was at the time in her mid forties and famous as an ambassador for Romania's cultural interests (Queen Marie was a grandaughter of both Queen Victoria of Great Britain and Czar Alexander II of Russia). At the time of the purchase of the sapphire, she also acquired a pearl tiara from Cartier, which she wore in the 'Byzantine' style. "The Coronation of King Ferdinand took place on 15 October 1922 and as part of her jewels, Queen Marie wore her splendid necklace perfectly complementing the extraordinary sapphire tiara she had bought from Grand Duchess Vladimir when she fled from Russia. These were also the two jewels that the Queen wore for her portrait by Philip de Laszlo in 1924. "The sapphire was sold, possibly in 1947 when King Michael (grandson of Queen Marie) left Romania and was acquired by Harry Winston. The last pictures of the diamond necklace without the sapphire were taken at the wedding of exiled King Michael of Romania to Princess Anne of Bourbon-Parma in 1948. It was subsequently dismantled. "Of the worlds most famous and historic cut sapphires, the gem offered for sale on November 19th is by far the largest, weighing 478 carats. Second in size, the Logan Sapphire of 423 carats, was donated by Mrs. John A. Logan to the Smithsonian Institute in 1960. 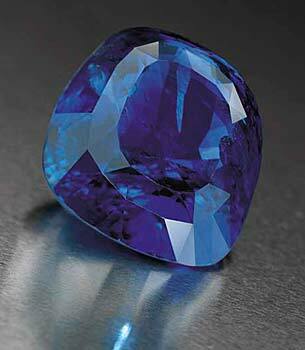 "The next two largest cut sapphires extraordinarily both weigh 337 carats. Catherine the Great's Sapphire was purchased in 1948 by Harry Winston and, as part of his 'Court of Jewels' exhibition toured the major cities of America from 1949 to 1953. It is currently on display in the Diamond Fund Exhibition, The Kremlin Armory Museum, Moscow. "Christie's of Geneva sold the other sapphire of 337 carats in May 1991. It had been part of a private collection since circa 1910 when it was mounted by Cartier. "There are only two historic sapphires recorded that are larger than the one now being offered for sale, both of which are in museums. The 563 carat cabochon star sapphire, the Star of India, was donated to the American Museum of Natural History as part of the J. P. Morgan collection circa 1900. The 547 carat polished sapphire, curiously named 'Peter the Great's Nose' which was originally given by Peter I to Augustus the Strong in 1698, is displayed in the Green Vault in Dresden, Germany. "Queen Marie of Romania's sapphire is the largest sapphire ever presented at auction and with its genuine beauty and fascinating history becomes what can indisputably be termed a unique jewel." Somewhere along the line after it was owned by Harry Winston, Henri Picq set in the platinum pendant you see here. At the auction, the stone ended up selling for 1,916,000 Swiss francs, equal to $1,494,480, or $175,880 more than upper end of the estimate, which was 1,800,000 Swiss francs ($1,318,600).